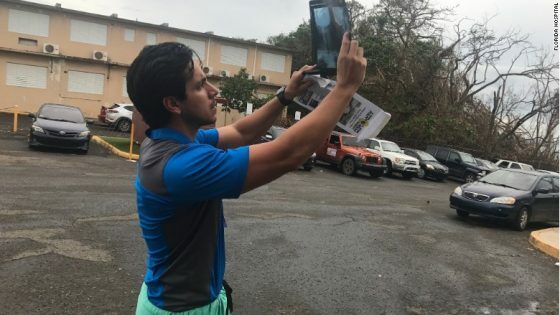 Dr. Trivino must use sunlight to examine x-rays since electricity is sporadic in Puerto Rico. On Friday, former Puerto Rican Governor Alejandro García Padilla tweeted a photo from inside a hospital, in which scrubbed-up doctors leaned over an operating table performing surgery lit only by a flashlight. According to Slate, the image quickly made the rounds on the internet; it currently has almost 9,000 retweets and many speculate that that’s probably because the blurry picture feels like it’s worth a good deal more than 1,000 words. It illuminates just a small sliver of the public health crisis Puerto Rico is currently facing. This article was posted in Alejandro García Padilla, clean water, Conspiracy Fact and Theory, electricity, Emergency Preparedness, Experts, FEMA, forecasting, Hurricane Maria, medical crisis, power grid failure, Puerto Rico, USNS Comfort and tagged commodities. Bookmark the permalink. Follow comments with the RSS feed for this post.Comments are closed, but you can leave a trackback: Trackback URL.